The TDS1000B and TDS2000B Series digital storage oscilloscopes deliver an unbeatable combination of performance and ease-of-use, at a price you can afford. With up to 200 MHz bandwidth and 2 GS/s maximum sample rate, no other color digital storage oscilloscope offers as much bandwidth and sample rate for the price. 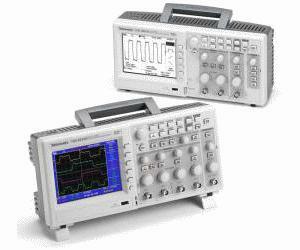 The TDS1000B and TDS2000B Series oscilloscopes provide accurate real-time acquisition up to their full bandwidth, the same record length at all time base settings, advanced triggers to isolate signals of interest, and 11 standard automatic measurements on all models. Their Fast Fourier Transform (FFT) and waveform add, subtract, and multiply math functions allow you to analyze, characterize, and troubleshoot circuits. The simple user interface with classic analog-style controls makes these instruments easy to use, reducing learning time and increasing efficiency. Innovative features such as the Autoset Menu, Probe Check Wizard, Context-Sensitive Help Menu and color LCD display (TDS2000B Series) optimize instrument setup and operation. With USB host and device ports which enable removable data storage, seamless PC connectivity, and direct printing, no other color or monochrome digital storage oscilloscope offers as much flexibility and ease of data transfer for the price.